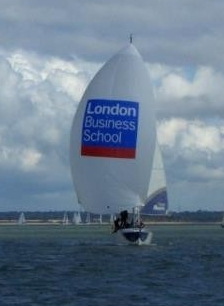 London Business School, despite only managing 11th place in the Rolex MBAs Cup Regatta were only 2 places behind their main rivals, INSEAD, and so retained the lead in the 2012 MBA Sailing League to win the title for the second time. INSEAD, with 9th place in the Bocconi regatta came second, while Bocconi, who were second in Santa Margharita came third. Fourth and fifth places were claimed by Cranfield and Rotterdam – both with good showings in Italy. LBS won the league with a first place at the ABC, two third places at Cranfield and Rotterdam and a fifth at the Global MBA Trophy in Athens to go with their 11th at the MBAs Cup. INSEAD were close behind, with two 3rds at GMT and ABC, a 6th at Cranfield, a 7th at Rotterdam and 9th at Bocconi. Bocconi, despite a win in Athens and a second in Santa Margharita, could not get the consistency across the other events, and missed out on the Rotterdam regatta in Lemmer altogether. Big climbers after the MBAs Cup were Rotterdam, climbing 10 places in the rankings to 5th in the league. IE also rose impressively: climbing 12 places to 9th, while Cup winners, EPFL join the rankings at 13. Last year’s MBAs Cup winners, Sauder, were the biggest fallers, dropping 15 places to 25th.